Have a Rooted Android Device? It’s time to try and experiment with new Apps that will definitely change the way Android look. The reason why we root our Android device is to get core features of our device that are not accessible unless we root our phone. By default, device manufacturer will add certain restriction to access core files and make extra-core changes to the device. But if you have Root Access, then there are no restriction or limitation in your device. You can do whatever you want with your device. And also make changes to system files as well. If you have not already Rooted your Device then this is time. 1 Why To Root Android Device? Why To Root Android Device? Rooting an Android device has tons of advantage and I will share a few among them. Out of the box, a new smartphone will not have Root Access and you can’t make any changes to System Files or make core changes. By rooting, you are actually revoking every restriction that currently your device has and allowing other third-party apps to make changes to system files. For example, after rooting, You can edit your system files and change the Boot Animation, etc. Got it? How about adding a Recycle Bin feature to your Android Device? Dumpster is a Data Recovery tool that will help you restore files you deleted from your device. You can restore any files that you deleted like Videos, Apps, Music, Documents, etc. Once installed it will act like a Recycle bin in your Computer. You can actually restore any files you deleted. This one is a lightweight App with tons of Modules for rooted Android Device. Customization is limitless with Xposed Framework. This app is somewhere around 4-6MB in size. Once Installed, Go to the Downloads section and install a module you like and simply activate it. You can find hundreds of modules in the App. Read the description of the particular module and install it. Greenify is a great app for preventing background use of any apps. Once installed, this app will show you the most battery draining apps, how they run, which time they run, etc. With this data, you can actually prevent or hibernate these apps from running in the background. This app will be very useful for extending the phone’s Battery life to a great extent. As I told earlier, with root access you can edit system files and folders. Root Explorer is one such app that will let you edit, change, or make a modification to any system file of your device. This app comes with many tools like Zip Extractor, Text Viewer, etc. You can edit files such as Build.prop with Root Explorer. Let’s say that some games are not working on your phone, you can easily change your device info and easily play that games. AdBlock Plus is free to use, open-source Application developed for preventing an annoying advertisement from your Android Device. This is a must-have App for any rooted android device. Some other apps are also available for the unrooted device as well. Once you install AdBlock Plus in your device, No more Advertisement will be displayed from any or browser. These disgusting Advertisement will drain both your Data as well as Battery life. SuperSU is a must have Android App for any rooted phone. This app will allow you to grant or denied Root Access to any App that asks for it. This app will also help you to Unroot, keep logs and much more in your device. Apart from these options, SuperSU comes with other major options to do various tasks as well. Titanium Backup is your one-stop solution for all Backup related problems. This app will let you easily create a backup file if all apps and data in a single click. You can export your Backup data as a .zip file and use it later. Other than creating backups, this app will also let you freeze apps(Prevent from running background), Block Apps, etc. This is one of the must-have App for any rooted device. Wakelock Detector is a free Android App that will let you prevent apps from running background. When we use our phone, tons of apps run in the background. We won’t see this app because this is running in Background. Actually, there is no use for running these apps. This is where Wakelock Detector app comes handy. This app will easily prevent any unwanted apps from running in the background, thus saving your Battery life. Viper4Android is an essential app for any people who are crazy about Music. This app will let you easily change the parameters of audio coming out from your device. Actually, You have limitless control over optimizing audio for better audibility, This app comes with its own Audio Driver and an Equalizer to mix up audios. It’s really tough for you to install Viper4Android in your Device, so make sure that you follow the official guide from XDA Developers for better understanding. That’s it, for Now, | I keep updating this article regularly with new apps, So make sure that you bookmark this page for future reference. 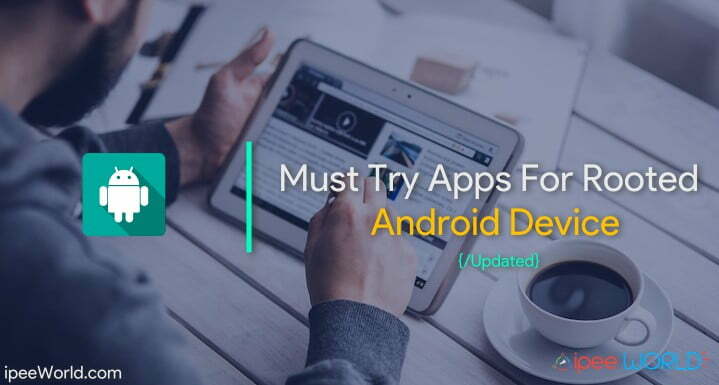 Hope you guys enjoyed the list of Must-Try Apps for Rooted Android Device. Install an app from the list that you think is good. Especially apps like Xposed Installer and Greenify are must-have apps for any rooted device. Many of us are unaware of these root applications, thank you for recommending these root apps.